At Puma, one of the world’s leading sports brands, mobile traffic in some regions was approaching 70%, but conversion ran woefully behind. What it wanted was to remove any roadblocks to purchasing, and to focus on the things that truly matter to mobile shoppers, not the things that consultants or technology providers say matters to shoppers. 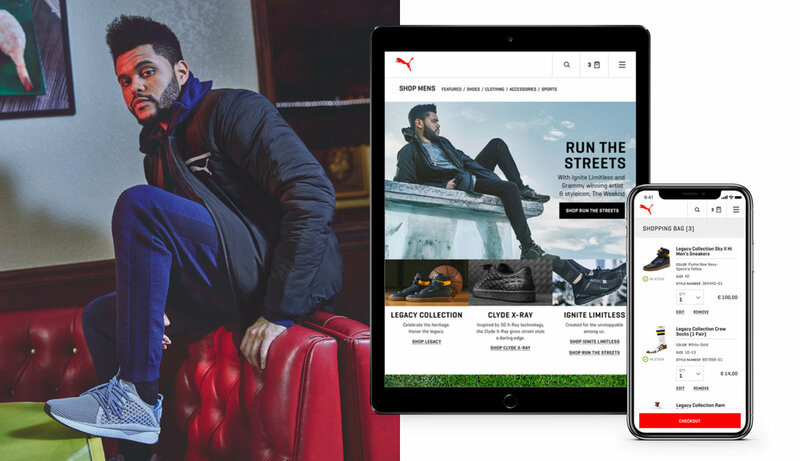 What it needed was a mobile-first platform approach to commerce - an evolution of Puma.com. We accomplished this by designing the mobile site first and upscaling up to desktop. Optimizing and adapting the mobile layout allowed customers click directly on products and check out easily and more conveniently. For over 65 years, Puma has established themselves by developing footwear, apparel and accessories for the best athletes and fit-centric celebrities on the planet, so how do you tell a cohesive story when you partner with such a diverse group of brand ambassadors? This was accomplished by creating a flexible design system that would allow promotions from Rihanna, Sesame Street, Arsenal Football (and over 100+ more marketing pushes a year) to all work together on the same page and scale perfectly from mobile to desktop. An editorial style “kit-of-parts” allowed their team to update content seamlessly, layer in campaigns and top selling categories, and highlight their most important partnerships. We continued this consistent visual look and feel from the homepage to the category page and then to the PDP, allowing shoppers to navigate through different campaigns and directly shop products easily throughout the buy flow. The pilot for the evolution of puma.com launched in the European region in the of summer 2017 as the first and only company on the new Salesforce Commerce Cloud Mobile-First platform. It has recently rolled out to the North American region with plans to expand to the other global regions over the next year.